Urban Nouveau has designed the scheme in response to Lidingö Municipality's plans to tear down the Gamla Lidingöbron bridge, which links the Swedish capital to the island of Lidingö, and replace it with a modern structure. 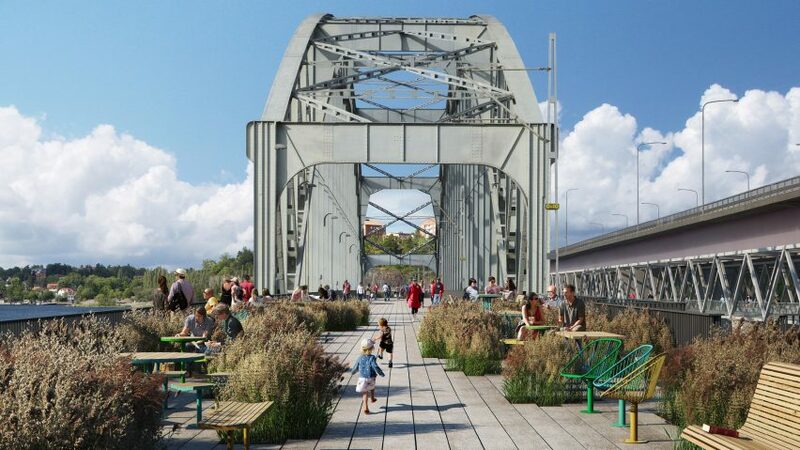 The studio has calculated that the sale of the homes would pay for the renovation of the bridge and its conversion into a "High Line-style public park". "The proposal is 100 per cent serious," Sara Göransson, CEO of Urban Nouveau, told Dezeen. "It resolves all infrastructural, technical, environmental and economical requirements. It is a fully feasible alternative to the generic bridge the municipality has decided to built." "Gamla Lidingöbron is unique and its cultural historical value increases with time," said Göransson. "It is more resourceful to fix the existing structure than to create tonnes of garbage by demolishing it. The bridge contains public memory and is an important symbol for Stockholm." "Rather than conservation, this project is about restoring and developing a historic structure as a way to save it from demolition," added Göransson. "After publishing our proposal in local media we received mostly positive comments from the local community. A public debate has started. With global support we will bring this project to reality," concluded Göransson.